A night cream that is delightfully smooth & delivers deep infusion of moisture to dry, stressed skin that is exposed to damaging UV rays, pollution & environmental stresses. Based on Kose's research on skin ageing, Spawake Age Solution Intensive Night Cream is enriched with Astaxanthin which supports natural skin renewal & bring lasting comfort overnight. After you wake up, skin feels soft & velvety. Intensively hydrated, skin appears revitalized, reclaiming youthful radiance. Explore the entire range of NightCream available on Nykaa. Shop more Spawake products here.Alternatively, you can also find many more products from the Spawake-Age-Solution-Intensive-Night-Cream range. Explore the entire range of Night Cream available on Nykaa. 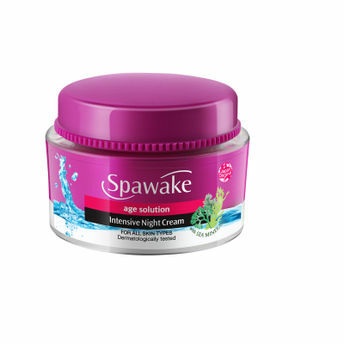 Shop more Spawake products here.You can browse through the complete world of Spawake Night Cream .Alternatively, you can also find many more products from the Spawake Age Solution Intensive Night Cream range.